US #95 – 1867 “F” Grill. On February 17, 1801, Thomas Jefferson was elected president by the US House of Representatives following an electoral tie with Aaron Burr. After penning the Declaration of Independence, Thomas Jefferson served in the Second Continental Congress, the Virginia House of Delegates, as governor of Virginia, and US minister to France. Upon his return to America after the war, Jefferson became America’s first secretary of state. 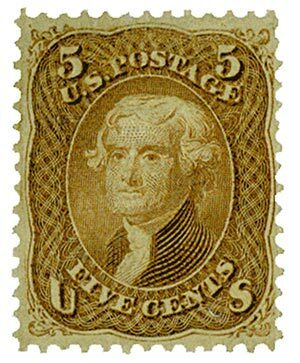 US #1053 is generally considered one of the most beautiful US portrait stamps of the 1900s. Appointed by George Washington, Jefferson disagreed sharply with Secretary of the Treasury Alexander Hamilton’s national fiscal policy. The primary debate was over funding the Revolutionary War debt. Hamilton believed the debt should be divided equally among the states. Jefferson, a firm advocate of states’ rights, believed that each state should be responsible for the debt it alone had incurred (Virginia had not accumulated a significant amount of debt during the war). Their disagreement led to further divisions in the new government, with Hamilton’s Federalists on one side and Jefferson’s Democratic-Republican Party on the other. US #1033 from the Liberty Series. 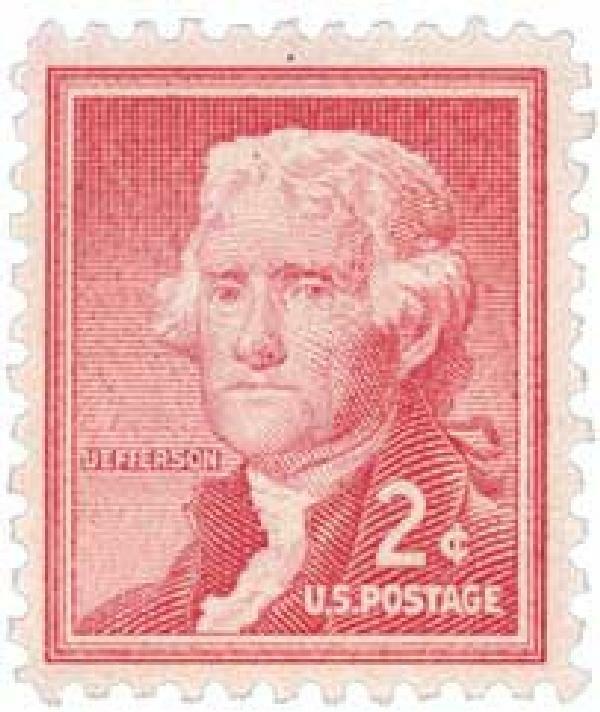 As secretary of state, Jefferson supported France in its war with England. In 1793, he returned to Monticello and began working with James Madison to undermine Hamilton’s influence. Jefferson lost the 1796 presidential election to the Federalist candidate, John Adams. However, he had enough electoral votes to be elected Vice President. 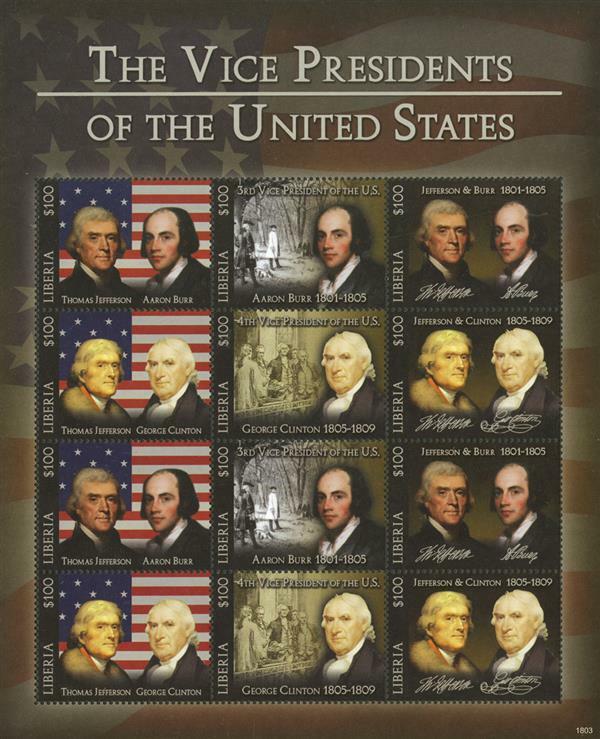 Item #M12135 – Mint sheet honoring Thomas Jefferson’s Vice Presidents Aaron Burr and George Clinton. Four years later, the Federalists lost the presidency and control of Congress. Jefferson defeated John Adams and received enough electoral votes to tie with Aaron Burr. The tie for first place in the election was to be resolved by the House of Representatives, which was controlled by the Federalists. In a lengthy debate, Hamilton convinced his colleagues that Jefferson was “by far not so dangerous a man” as Burr. After deadlocking in 35 ballots, the House of Representatives chose Jefferson by a margin of ten to four on February 17, 1801. Though they had been running mates in the election, tensions were high between Jefferson and Burr during their time in office. Jefferson ultimately replaced Burr in the 1804 election. 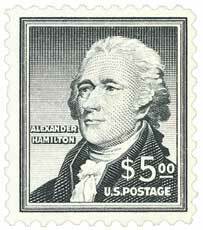 The 1800 election was one of the catalysts of Burr’s fatal duel with Alexander Hamilton. This entry was posted in February 2018, This Day in History. Bookmark the permalink. 21 Responses to "This Day in History… February 17, 1801"
The Electoral College method of electing the President was flawed from the start. They should have fixed it way back then, but it’s too late now. Twice in the last five elections (2002 and 2016), a candidate won the Electoral College despite the fact that the majority of the American people voted against him…and look what we got! Yes, we received an America loving President. Yeah, and I’m sure you’d still have written this comment if it had worked out the opposite way. Oops, that’s 2000 and 2016. What we got was better than the alternative in both cases. If you think Gore or Clinton would have been better for America than you have been drinking the cool-ade to long. Leave the electoral college alone. The founding fathers were a lot smarter than our current so called leadership. Great article. Agree totally. A few big states would elect our president – not something any of us want to happen. Thank God for the wisdom of our forefathers, with out the electoral college New York and California would determine Americas President. While I do understand the logic for the smaller states to have a say in the presidential elections, I do not understand why there can’t be a national primary day for all states. The current crazy primary system gives certain states the power to determine the nominee. By the time the early states have had their primaries, the later states just go through the motions. And then there are the “super” delegates. It’s crazy! A vice presidential issue???? Spiro Agnew later???? Liberia???? 2008&2012 a Fancy fellow born in Kenya, as the Haavaad Law review bragged.Try to get a copy of that one from Haavaad, that’s what we got. Point one..CA lets recently arrived(5 minutes) vote. Point 2 the major cities on the coasts get to select. We have seen the scorn heaped upon those worthless folks in the South & Midwest who produce such non-essentials as food. Such nasty and entirely predictable comments from Trump lovers. I know, I know, to Trumpistas, he can do no wrong no matter what he does or doesn’t do. In my opinion, and this will probably bring on more tasteless and nasty comments, Trump will be regarded in history as the worst President of the U.S. since at least the Civil War. OK, Trump defenders, have at it. Sounds like everyone is entitled to their opinion as long as they agree with you. For such a staunch defender of democracy and instructor of history for 38 years you sound a little “menschy” to me. We have the Electoral College for the same reason that we have a bi-cameral legislature. Look where we would be if we only had a unicameral legislature. The party in control of the House of Representatives would be able to enact ANYTHING they wanted; with no checks or balances of any kind. The Founders were very smart, in my opinion. (Plus, we would never have had a country at all, if not for the compromises which led to a Senate – based on equal representation, no matter how large or how small the State – and a House of Representatives – based on population. Likewise, we would never have had a country without the Electoral College. It was a compromise, based on the exact same reasoning as the Bicameral legislature. Not enough States would have ratified the Constitution without it. Besides, personally I am glad we don’t decide our Presidential election on the basis of the “popular vote” alone. In my estimation, there are too many voters who are ignorant, uninformed, or only vote one way or another for the most foolish of reasons. AMEN! Agreed that the large states would determine everything in the country, and there are so many voters who do not make their own decisions, but let others make it for them. As Voltaire so famously said, “Common sense is not so common”! Fantastic article Mystic, keep up the good work! Interesting, when you say “large states,” you are referring to the states with the most people. The people in these states pay most of the taxes, supply most of the people who serve in the military, and have the most to lose when a minority government is in power. Why shouldn’t most of the people have most of the say? A voter in a small state like North Dakota or Alaska has about 50 times the say as a voter in New York, Texas, or California. That’s not right! The principle of “one man (or woman), one vote” should apply. There are many suggestions as to how to reform the Electoral College. To mention one: assign a state’s electoral vote proportionally. If 50% of the popular votes go to candidate A, 40% to candidate B, and 10% to candidate C, assign the electoral votes accordingly. But forget about it. Since any Constitutional reform has to be ratified by three fourths of the states, the small states would never approve of any change. And, thank you Edward for remembering who I am. My pleasure Mr. Gaunt. How are things in California? Well, we are in the early stages of another classic drought.